The Coffee Spot is One! Today’s Saturday Supplement marks a very special occasion: the Coffee Spot is one year old! Exactly one year ago today, at 14.15 on Friday, 28th September 2012, the Coffee Spot was launched with great fanfare. I can’t be too sure how many people actually visited the Coffee Spot that day since I wasn’t really paying attention, but I’m sure it wasn’t that many! Fast forward to today, 123 posts, 107 Coffee Spots and over 31,000 views later, and the Coffee Spot is doing quite well, in no small part to you, dear readers. The whole point of the Coffee Spot is to share the love of great coffee and great places to have coffee. Without you, my readers, there would be no sharing, so thank you one-and-all, whether you’ve read every single Coffee Spot since the launch or whether you just dip in and out when you feel like it. This special Saturday Supplement, a review of the year gone by, is dedicated to each and every one of you. And, by way of saying thank you, I have a very special competition (with prizes!) at the very end of the post! What follows is a month-by-month breakdown of the first year of the Coffee Spot’s life. Each month starts with a gallery showing all the Coffee Spots published that month. If you want to know more, just click on the picture and you’ll go straight to that particular Coffee Spot. Don’t forget the competition at the end of this post. The Coffee Spot was launched at 14.15 on Friday, 28th September 2012. At that time, there were just three Coffee Spots on the site: The Boston Tea Party, in Park Street, Bristol, which still holds a special place in my heart; Abriachan Campsite and Café, still one of the most out-of-the-way places I’ve ever written about; and To A Tea, in the heart of the City of London. To A Tea was particularly important since its focus is on tea and cake as much as it is on coffee. Although this is the Coffee Spot and I personally can’t stand tea, I’m aware plenty of you do like the stuff and I didn’t (and still don’t) want my tea-loving readers to feel excluded. October saw the start of the Coffee Spot proper. The original intention was to post once a week, but since I already had a backlog of places to write about, I started publishing twice a week, on Mondays and Thursdays, partly to get through the backlog and partly to ensure that there was plenty on the Coffee Spot for new visitors to read. October featured many of my old favourites, places I’d been going to for years, including Bar des Arts in my home town of Guildford, Mimi’s Bakehouse in Edinburgh (well, technically Leith) and some London stalwarts, the legend that is Bar Italia, along with The Camera Café and Wild & Wood. There was also space for my favourite Coffee Bean retailer, Guildford’s Coffee Charisma. November came along and I was still publishing twice a week, having discovered that the more I looked for good coffee shops, the more I found them. November also saw me venturing further afield, with a trip to the West Country, featuring the likes of Coffee Bean Central in Plymouth, Teignmouth’s Oystercatchers Café and Exeter’s Exploding Bakery. Old favourites such as Anna’s Tea Rooms in Conwy rubbed shoulders with newcomers such as London’s Bea’s of Bloomsbury and the unique Brick Lane Coffee. The end of 2012 saw the Coffee Spot going from strength-to-strength and spreading its wings even further afield. The likes of The Coffee Company of Bebington in the Wirral joined the amazing Café Boscanova from Boscombe on the south coast. I also made a Coffee Spot tour of Edinburgh, two caffeine-fuelled days including old favourites such as Artisan Roast and the new delights of Brew Lab. The year was rounded off with the announcement of the short-lists for the first ever Coffee Spot Awards. 2013 got underway with the announcement of the winners of the Coffee Spot Awards. It also saw the remainder of the places from my Coffee Spot tour of Edinburgh, with such delights as Freemans Coffee, more from Bristol with the amazing Small Street Espresso and Reading’s wonderful Workhouse Coffee. Finally, I got around to launch the Coffee Spot map to help you find your favourite Coffee Spots. January also saw the Coffee Spot break through 3,000 views in a month for the first time. On a less positive note, Poppy Mae, in Bournemouth, a lovely little place, closed shortly after I wrote about it. On a more positive note, as far as I know, it’s the only permanent café that I’ve written about (and so far I’ve covered over 100) that has closed down. February continued with the likes of Bristol’s The Bristolian, an old favourite of mine, re-imagined under new ownership. It also saw the Coffee Spot heading up to Manchester with North Tea Power and Caffeine & Co. Finally, at the end of February, I jetted off to North America for a tour that would take me through Boston, New York City and Montréal. This resulted in the Coffee Spot’s first-ever overseas posting, Boston’s Caffé Vittoria. With me in America, March was a slow month, but saw the first Coffee Spots from New York City (Pushcart Coffee) and Montréal (Pikolo Espresso Bar). Back in the UK there was time to squeeze in a trip to Coventry’s Kahawa Café and to report on Guildford’s first-ever pop-up coffee bar, Guerra Coffee. April opened with the delightful Foxcroft & Ginger who have the best muffins ever (this is no exaggeration!). In the opening days of April, the Coffee Spot also recorded its 10,000th visitor. Mixed in with more Coffee Spots from my North America trip, including the amazing I Am Coffee, the Coffee Spot also featured places from around the UK such as Lincoln’s Coffee Aroma and the Worcester branch of the Boston Tea Party. April also saw the launch of the Saturday Supplement, articles that I wanted to publish but which didn’t quite fit the Coffee Spot description. April saw two Saturday Supplements, a preview of the London Coffee Festival and a review of my visit to the Festival on the Friday. The month of May saw two new Saturday Supplements, the first on the London Coffee Festival and the second on the Caffé Culture Show. There were more places from my North America trip, including Boston‘s True Grounds and Montreal’s Cafe Olimpico. There were more firsts for the Coffee Spot as well, with a trip to Newcastle, featuring such delights as Pink Lane Coffee and Flat Caps Coffee, as well as the Coffee Spot’s first trip to Paris, featuring Ten Belles. June got underway with another first for the Coffee Spot, a Saturday Supplement entitled “Good Coffee In Paris?”, my first ever opinion piece. June was also the Coffee Spot’s busiest month so far, with 13 posts, five of them being Saturday Supplements. This included the first ever Coffee Spot Update, where I go back to a place I’ve previously written about, and the first ever Saturday Short, the Look Mum No Hands Pop-up on the South Bank. The end of June saw the Coffee Spot hit 20,000 views. Having taken five months to reach 10,000, it was particularly pleasing to get the next 10,000 in under three months! July saw the Coffee Spot down in Southsea with the Southsea Coffee Co. As well as the last places from my North America trip back in March, there was plenty of home-grown talent on display, including Attendant, the London coffee shop in a disused Victorian gents toilet, and The Press Room in Surbiton. Closer to home, July also saw the launch of the new Bar Des Arts coffee menu in my hometown of Guildford. The most popular month so far, August saw over 4,000 views on the Coffee Spot, with the likes of Bristol’s charming @the Well rubbing shoulders with Cardiff’s Waterloo Tea and London’s The Borough Barista and Four Corners Cafe. The Coffee Spot also made it to Birmingham for the first time with Yorks Bakery Café and 6/8 Kafé. The month closed with a trip to Doctor Espresso’s Caffettiera, home of London’s oldest working espresso machine. September saw the Coffee Spot record its 30,000 view and also see the number of countries visiting the Coffee Spot reach 100. The bulk of the visitors are still from the UK (80%) but it’s pleasing to see so much interest from around the world. September opened with London’s The Fields Beneath, followed by Reading’s Workhouse Coffee on King Street. Closer to home, I finally made it down to Café Mila in Godalming as well as making a first trip to Brighton (The Marwood) and Hove (Ground Coffee House). Finally, the Coffee Spot hit the North West with Liverpool’s Bold Street Coffee, The Barista’s Chester and, to get the Coffee Spot’s second year off to a great start, Colne’s About Coffee slipped into the final day of September. And so that’s it. A whole year has just whizzed by. As a thank you to all my readers, I’ve decided to hold a competition. All you have to do to choose your favourite Coffee Spot and then let me know about it. It’s up to you what makes somewhere your favourite Coffee Spot, but the emphasis should be on the Coffee Spots themselves rather than my writing about them! Once you’ve decided, then let me know, either here or on twitter or Facebook (I’ve given up trying to get the competition to work on Google+). – tweet a link to your favourite Coffee Spot and tag Brian’s Coffee Spot in your tweet. Tagging the Coffee Spot is very important, otherwise I won’t know you’ve tweeted the link, so you won’t get entered. – post on your own timeline (not the Coffee Spot’s!) 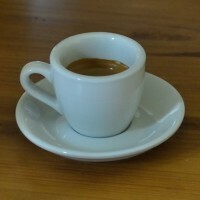 with a link to your favourite Coffee Spot and tag Brian’s Coffee Spot in your post. Logically, tagging the Coffee Spot would lead to me be notified that you have posted the link, but, of course, Facebook knows better than to provide useful features like that. So, if you want me to know that you’ve entered the competition, you will have to send the Coffee Spot a message on Facebook as well… Sorry it’s such a faff, but that’s Facebook for you! I’ll pick a winner at random from each (Coffee Spot, Twitter, Facebook) and you’ll receive (by post, so I’ll contact you for your postal address) a Coffee Spot bookmark, postcard and greetings card. If you are entering on the Coffee Spot, please ensure that you are registered with a valid e-mail address so that I can contact you. Twitter/Facebook winners will be contacted via private message. My favourite has to be your Guerra Coffee post, as it’s how I found The Coffee Spot! I was searching for more information about Guerra following a trip to them and chat with the owner. Low and behold, this website was a search result. I’ve enjoyed keeping up to date since and have discovered and made trips to other great coffee shops, such as Southsea Coffee Co. directly as a result of this website! So thank you very much, and keep it up! oops, I completely misunderstood the brief! In that case I’m picking Brewlab in Edinburgh. Their coffee is great (as with all the places you’ve reviewed), and I love its relaxed atmosphere and decor. I’ve updated the description, so hopefully it should be clearer now! My favourite coffee spot is (or rather would be, if I drank coffee) Bar Des Arts in Guildford. Feel free to call me biased but I love the atmosphere so much that my husband and I held our wedding reception there in May 2013! That’s a better reason than most! When I discovered your blog (about 30 mins ago) my one thought was: I must tell Brian about Marwood. But, no need! I see you’ve been there. As a Melburnian living in London, I loved Marwood when we visited Brighton. The coffee is lovingly prepared by Antipodeans and the decor and vibe is arty and studenty (I think a couple of patrons may have been tapping out novels on laptops when we were there. A tiny slice of Melbourne and your latte is served in a duralex glass. Anywhere else I should be going? I also visited a place in West Bay near Lime Regis and can’t remember the name but AMAZING coffee.. best I’ve had since Melbourne ) something ‘yard’… great anyway. My favourite entries were also Bristol based: Small Street Espresso and Full Court Press. They were the first I read on the site after someone asked me if I had started a coffee blog (I work in Coffee/Tea industry). It really made me think about my Starbucks habit (used to work for them) and the coming of the third wave. Small Street is a great example of people who love and care for their business serving great coffee and great food (Harts Bakery) whilst FCP is like going to class; every time I visit I learn something new and enjoy great coffee, usually pour through. Thanks. Such praise from an industry professional! I’m glad the Coffee Spot has been of such use to you 🙂 Small St and FCP are two of my favourites too! The only one of your reviewed spots I’ve been to is Bar des Arts, so I suppose, of necessity, that’s my favourite. My actual favourite coffee spot is Bottega dei Sapori in Alton (known to everyone in the town as “The Italian Coffee Shop”). It’s run by husband and wife team Maggie and Issi. Maggie makes all the cakes, which are without parallel and Issy makes the icecream. I shall definitely have to pay that a visit! Sounds like it’s right up my street, so to speak! Liquidjolt if you are reading this, do you know about Bottega dei Sapori? Oh, by the way Brian: a dire omission in the above. Despite displaying such excellent recall of your past year’s travels, you have forgotten one very important thing (tut tut). Technically this is a birthday, yes? I expect a picture of a suitably grandiose BIRTHDAY CAKE to be posted/tweeted asap. The muffin may be sublime but does not qualify. Sorry. Hopefully all the winners will have received an e-mail or message from me with details of how to claim their prizes!